The spinal muscular atrophies (SMAs), are characterized by degeneration of nerve cells (motor nuclei) within the lowest region of the brain (lower brainstem) and certain motor neurons in the spinal cord (anterior horn cells) leading to muscle weakness of the truncal, and extremity muscles initially, followed by chewing, swallowing and breathing difficulties. Motor neurons are nerve cells that transmit nerve impulses from the spinal cord or brain (central nervous system) to muscle or glandular tissue. 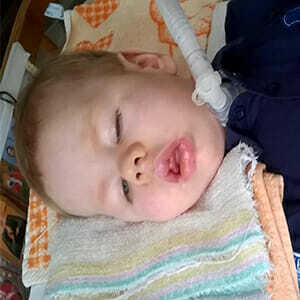 Since the birth the boy is immobilized and usefull intensive care equipment is very small for him. In childhood had Ilya pneumonia and since this the boy is connected to the system of artificial ventilation of lungs. Despite of Werdnig-Hoffmann disease Ilya is very curious, he is also very interested in everything that happends outside, and likes animated cartoons. Special care equipment will allow Ilya to improve the quality of his life and will facilitate daily procedures and efforts. “Despite of this diagnosis our son grows and develops. For us is important to find facilities for acquisition for a special bed because it will allow our son to sit and communicate with the family”, – Ilya’s mother, Natalya says. Only together we cah help the boy and his family to find hope!